Personalized Business Card Holders Custom Printed in Bulk. 48, 96 cards. Promotional, Inexpensive. Lowest cost in the USA and Canada. 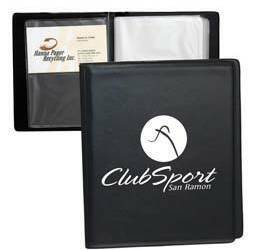 High quality, yet inexpensive Business Card Holders in bulk, customized with you logo. We supply 2 models: Item # AS852: large business card holder for 96 cards and Item # K0854: Small Business card Holder for 48 cards. We also supply blank (not personalized) Business Card Holders: K0853 at $1.39 each and AS852 at $2.75 each. Free artwork design and Free proofs! American clients pay no taxes. The unit prices below include your 1-color custom imprint on one side. Add the amount shown for each additional imprint color. 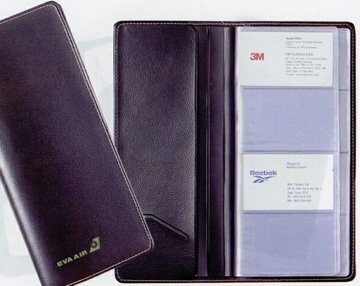 We also supply blank (not personalized) Business Card Holders: K0853 at $1.39 each and AS852 at $2.75 each. Setup Charge: $45.00 per color ; Re-order Setup Charge: $30.00 per color. Additional Imprint Colors: available only for the AS852: please add $0.45 per color, per item. PRODUCTION TIME: 5-10 days after art approval; Rush 3 day production is available: contact us. Blank items ship next day. Material: Leatherette (Leather Imitation Vinyl). 24 pages with 4 clear pockets each. 24 pages with 2 clear pockets each.